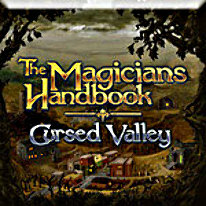 Travel to the mysterious Cursed Valley to reveal the pages of the Magicians Handbook, and remove the curse that has long haunted the valley. Set out with your trusty wand in hand to find enchanted objects hidden throughout the valley that will help you to break the evil spell. Ward off the shadow and other distracters of light, using incantations that you learn along the way. Can you remove the curse from the valley and rediscover its true name?